If you are thinking that a cruise is not for you, well maybe the Oliver Hazzard Perry is your answer. The name Commodore Oliver Hazzard Perry is a familiar for anyone in Rhode Island, it's the name for one of our most traveled roads here in the South County, but did you know that he led us to victory over the British in the Battle of Lake Erie in the War of 1812. His namesake ship is now in port at Fort Adams in Newport, Rhode Island. It is the first ocean-going, full-rigged ship to be built in the United States in over 100 years. 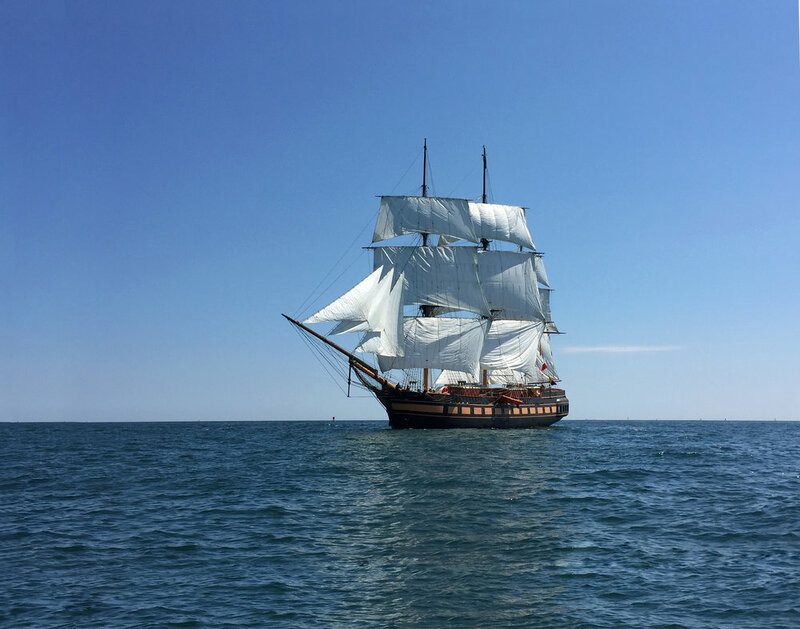 Here ends your history lesson, this amazing ship takes 32 trainees and 17 professional crew members as a 'sailing school vessel' on a voyage that leaves from Newport or Boston up to Nova Scotia (there is also a shorter legs available). But don't think you will be kicking back and laying around this ship... On the Oliver Hazzard Perry you will take on the duties of any sailor. This ship doesn't take passengers, everyone has a role - which includes working the sails (crewing), working in the kitchen (galley), and keeping things neat and tidy. Everyone is involved, this program is focused on growth and leadership development for students of all ages. Get a taste of life on a tall ship! Hands-on, inspiring, innovative learning - experience climbing aloft, hauling lines and being at the helm. This ship is some 200 feet, with 7 miles of rope, 160 belaying pins and 20 sails! From what I can understand the ship is traveling the seas so you need to check the website to see where it's at and where you could pick up your journey. At the moment they are offering voyages for the summer of 2017, including the eastern seaboard up to Nova Scotia, Canada. There are 7 day legs or 15 day legs of the journey that you can take, this is a non-profit ship and you will be working all the while so accommodations are NOT luxurious. There are two, 16 bed berth with 2 shared bathrooms - which means you are sleeping in a tiny bunk with 16 people! But what a fantastic experience for any teenager (or any age for that matter!). Many Moons - only a few left! Summer Travel and a Solar Eclipse!